Bridal Falls Part of the BC Adventure Network. Over a million web site visitors annually ! Beautiful Bridal Falls located on BC Highway # 1, just 16 km (10 mi.) east of Chilliwack, and south of Hope, is everything a vacationer could want. 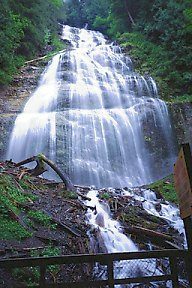 For years this sixth highest falls in Canada has beckoned people to stop and stay awhile.The falls drop 122 metres (400 feet) to the valley floor at Bridal Falls Provincial Park and flows into Bridal Creek which makes its way to Cheam Lake Regional Nature Park and the Fraser River. Watching over this profusely green forest retreat is spectacular Mountain Cheam towering 2107 metres (6910 feet) high as it reaches for the sky. Over the years, Bridal Falls has evolved into a great all-round resort area, with family attractions that include Dinotown  a dinosaur theme park, water slides, a golf and country club, bumper boats, world renown gardens, and a large campsite with pool. 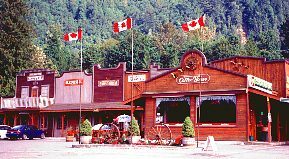 This is augmented by a mini mall that features a mineral display, restaurant, food store, two gift shops, antiques, an ice cream shop and a gas bar. When travelling from Vancouver heading east, take exit #135, if going west its exit # 138. Enjoy the perfect break in Rainbow Country a stay at Bridal Falls with all its family fun attractions.